Biological filtration, or the conversion of waste and excess nutrients into some innocuous form by means of organism metabolism, is one of those concepts that everybody seems to understand. If there is a problem with the term, it is that everybody understands it differently. In its broadest sense, it seems to be a term used to mean the conversion of biologically produced noxious wastes into something benign. In a stricter sense, the term is frequently used to mean, specifically, the conversion of ammonia and nitrate ions into nitrogen gas. Whatever its usage, it is a given that aquaria, in general, and reef aquaria, in particular, must have some sort of efficient biological filtration. always being fond of a bit of human pyrotechnics, I thought maybe I could sprinkle a little gasoline on the fire. One of the tried and true methods of providing biological filtration is by the use of "live rock." This method has been suggested by virtually every author, including myself, who has written about the aquarium hobby for the last 15 years. The advice to use live rock as a biological filter has been accepted for so long that it has become dogma. I think it is always useful to question dogma. It is easy, and comfortable, to be dogmatic, but progress comes only with periodic and critical re-evaluation of dearly-held ideas and practices. With this thought in mind, I believe it is time to critically re-examine the uncriticized use of live rock in reef aquarium systems. My first introduction to the concept of "live rock" occurred in the 1980s when I initially considered setting up a coral reef aquarium. At that time I lived in a large city and was only vaguely aware of the concept of ordering livestock by mail. The internet was in its infancy and online vendors were non-existent. Consequently, like everybody else, I got my live rock from my local aquarium store. Each piece was critically and lovingly examined for its animals and algae. There was even a competition of sorts in my aquarium club to see who could get the best rock for their aquarium. What constituted "good" were the color and variety of algae and animals on the rock. Most of this rock originated in Floridian waters, although some seemed to trickle in from other exotic places. This rock was lush with life and often obviously riddled with holes or pores. Consequently, when somebody started discussing how the rock acted as a biological filter, it was pretty easy to accept. The porous nature of the live rock's interior was a ready-made substrate for denitrification bacteria. It seemed like a logical idea at the time, and we all pretty much accepted it. And we accepted it without very much thought. I don't recall anybody asking the really critical question, "How, exactly, do bacteria growing inside of rocks 'filter' aquarium water?" Or, even better, "How, exactly, does water get into and out of live rock?" If anything was said at all, it was something along the lines of, "Bacteria growing on the surfaces of the interior of the rock did the denitrification, and the water flow through the rock was slow, so that the appropriate conditions of reduced oxygen were met to facilitate the whole process." That almost sounds like it makes sense, but does it? I would like to examine the assumptions underlying that statement, one by one. The interior of the rock contains denitrifying bacteria. Water moves through the rock, at just the right velocity to facilitate denitrification. One thing that should be evident is that for live rock to function as a filter medium it must be porous. Additionally, that porosity has to be sufficiently small so that the rock contains many pores and cavities, for only if there is a lot of pore space is there going to be sufficient filter area to accommodate the bacterial populations that produce the actual chemical changes. Finally, the interior of the rock has to provide the appropriate physical environment, primarily slow water flow and low oxygen concentrations, to facilitate the appropriate bacterial processes. Live rock is composed of numerous materials having differing characteristics with regard to porosity. However, many studies have documented the porous nature of coral reef rock. Our so-called "live rock" is generally coral reef rubble collected and sold to aquarists. This rubble is comprised primarily of coral skeletons, or a mixture of coral skeletons cemented together by calcareous algae. Upon examination of the material of a coral reef it becomes apparent that corals are only one component of the life on such a reef, and although they appear large and evident, their contribution to the actual amount of living material on the reef is relatively small. In their pioneering study of the reef at Enewetak atoll, the Odums in 1955 showed that the majority of non-bacterial biomass on a "coral" reef was actually in the form of algae. They found that various types of algae were everywhere. There were algae growing in the coral tissues, of course, as zooxanthellae, but additionally there were algae growing freely and widely across the coral reef. 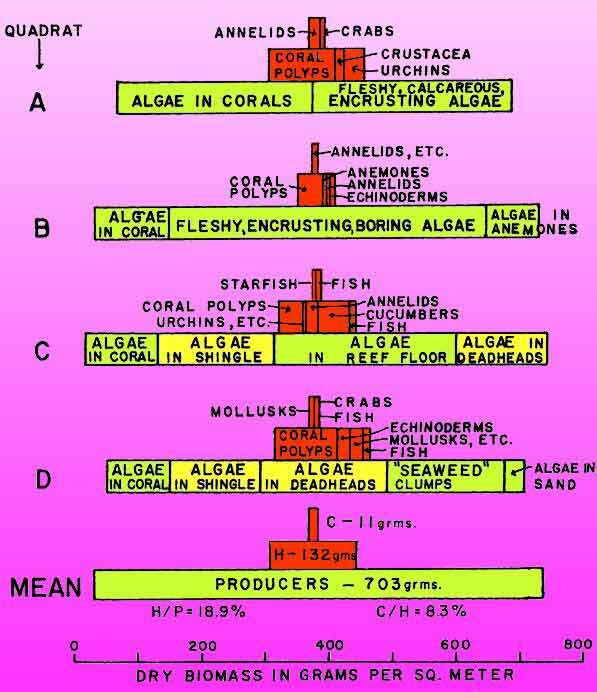 The algae on the surface of the reef were diverse in form, and belonged to many groups, from large green algae such as Codium, to coralline red algae, to coralline green algae, to diatoms and dinoflagellates. In point of fact, they found enough algae on the reef to consider it far more reasonable to call such reefs algal reefs instead of coral reefs. I wonder how many aquarists would be hobbyists today if these biogenic structures were named after their most abundant life forms and called "algal reefs" rather than coral reefs. In addition to the algae growing visibly on the surface of the rocks, the Odums were surprised to find that algae were growing INSIDE of all the substrates on a reef. Algae, primarily filamentous green algae, lived inside of coral heads, inside of dead coral skeleton, and inside of all coral rock and rubble. In fact, on an old coral atoll such as Enewetak where all evidence of the volcano that gave the reef its start has vanished with subsidence (the volcanic basis for the reef at Enewetak is found under some 5,000 feet (1515 m) of coral reef deposited over several million of years coral growth), virtually all of the rocks are riddled with algae and contain a lot of algal growth and biomass. The Odums found that in the average coral head, in the region of the polyps, the density of the algal component was about 0.004 grams/cm3 and the animal component was about 0.021 g/cm3, while among the bases of the polyps the filamentous algae had a density of about 0.022 g/cm3. 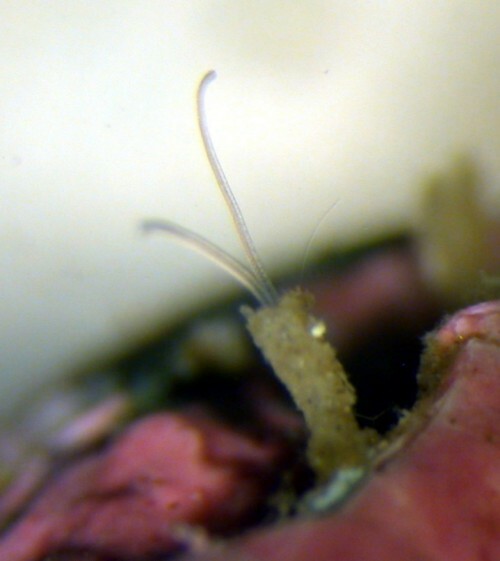 Below the polyp zone of the coral head the algae had a density of 0.037 g/cm3. In other words, in a coral head with living coral tissue on it, the animal component accounted for about one-fourth of the total, 0.021 g/cm3, while the various algal components amounted for 0.063 g/cm3. Interestingly, as well, the filamentous algal component of a coral head had a much greater biomass (about 16 times greater) than did the zooxanthellae in the coral. The algae in the coral heads do not die when the coral animal does, and the amount of the coral algae in various rock components of the reef is shown in Figure 1. This figure, modified from the Odums' 1955 paper, shows the relative biomass of several rocky areas on the reef. I have colored the algal biomass amounts green, and the biomass inside rock that could be collected as live rock in yellow. The amount of algae living inside the various components of coral rubble and rock is quite significant, and those algae are quite important to our discussion of live rock porosity. If corals are grown in environments free of the algae that colonize their skeletons, those skeletons are typically quite porous. However, the algae growing within the rock add to the porosity by dissolving fine holes for their filaments. Figure 1. Dried biomass from several different coral reef sites on Enewetak. Modified from Odum and Odum, 1955. This is probably the easiest of the assumptions to validate. Most authorities (see Capone, et al., 1992) consider that such bacteria are ubiquitous. They are likely found in virtually all habitats at least in small numbers, but thrive in almost all areas where the conditions are to their liking. The inside of the live rock would be a good place for them, and it appears that they are probably there (Risk and Muller, 1983). It would seem that the assumption that live rock contains the appropriate denitrifying bacteria is therefore valid. This assumption is probably the hardest to evaluate. The major question we have to ask ourselves is, "How does water move through the rock?" One occasionally hears the statement from aquarists that water "diffuses" through live rock, just as one occasionally hears the statement that water "diffuses" through sand. Neither statement is correct. Water doesn't diffuse through either of these substrates. Materials dissolved in water may diffuse from regions of higher concentration to regions of lower concentration, but the water itself doesn't move in these situations. The only time that water moves through diffusion is in the special case of diffusion called osmosis, and in that situation a membrane has to separate the two regions of differing concentrations of solutes in the water. Such conditions are not met in live rock, and there is no net movement of water into or out of it by diffusion or osmosis. Interestingly enough, it is possible that dissolved materials such as the various chemicals constituting the denitrification cycle do diffuse into and out of live rock; however, it is unlikely that such diffusion moves any significant amount of materials. Calculating diffusion rates into and out of the volume of a rock is complicated and includes such variables as the water flow over the rock, the dynamic viscosity of water, the rock's size, and the diffusion coefficient of the material in question through water. When all of the various parameters are factored in, for the various gases or ions in question, the passive diffusion rates are probably on the order of 1 x 10-4 m2/sec. Assuming a constant concentration gradient, and a uniform porosity such a rate means that gases would diffuse in through the volume of the rock at the rate of roughly a micrometer per second, so that in an hour the gases would diffuse about 3.6 mm, or about an eighth of an inch. If a volume is 10 cm in diameter, gases would diffuse to its center from its outside edge in about 14 hours. However, the gases would move considerably more slowly through the live rock than they would through an empty volume. The small diameter of the passages or pores in the rock would restrict the flow significantly. It is unlikely that the flow rate would approach the estimated value, and even if it did the relative volume of the gases exchanged would be minimal. For a significant amount of gas exchange to occur there has to be continual movement of the water into and out of the rock. Given the minuscule pore sizes in these rocks, the water movement cannot be generated by water currents outside the rock. The resistance to movement of water in small tubes, such as the pores in live rock, is considerable. The only motive force sufficient to move enough water through the rock, so that it may act as an efficient denitrating site, is the force generated by the animals, mostly the worms, living in their burrows. These worms move back and forth in their burrows and in doing so they move the water in the burrows in a pulsating fashion. Many of the burrows and pores are interconnected, either intentionally or by happenstance, and these interconnections result in water movement into and out of the rock. Additionally, many of the worms and other animals in the rock pump water over themselves in their burrows. They do this to facilitate gas exchange over their gills, but the net result is a significant, constant, and moderate current through the rock. Such a current, coupled with oxygen utilization of animals in the rock, could result in the interior of the rock becoming the efficient denitrification site that it has been thought to be. Figure 2. Individuals of this species of small worm, possibly a species of Polydora, about 1/25th of an inch in diameter, live in calcareous substrates where they chemically excavate burrows. Motion of such small worms up and down in their tubes helps to pump water slowly, but regularly, through "live" rock. There is only one problem related to the use of live rock as an effective source of biological filtration. For the rock to be the site of efficient biological filtration, water has to be passed slowly and steadily through the rock. The most likely way that will happen is by the activities of the myriad of animals that live in the rock. Of course, for this to happen there must be animals living in the rock, and lots of them. Therein lies the problem with using live rock as a biological filter. Live rock comes from many sources in today's hobby, and the products that these vendors provide are by no means uniform in their capability to provide biological filtration. The live rock may be collected and shipped "as is," or it may be "treated" or "cured" in different ways to remove various components of, primarily, the animal fauna living on and in the rock. Some collectors and vendors go to great lengths to ensure that their rock is free of as much of the material as possible that can potentially rot and foul a system. These vendors provide rock that often is covered with a large amount of coralline algae, and very little else. This rock is free of much of the material that can die in transit and rot in the destination tank. It is also free of most animal life. This rock can provide a beautiful backdrop or substrate in a tank, but, unfortunately, it simply can't provide much in the way of biological filtration. The small animals that moved water through the rock are not only dead and gone, but there is likely no fauna available to colonize the live rock and replace them in the destination tank. This rock is full of dead space and algae. Once in the destination tank, such rock will become populated with algae, much as it was in nature. However, there will be no water pumped through the small channels and pores in the rock, and such pores will begin to fill in, primarily by the growth of algae. Such rock has quite a potential for the internal buildup of noxious compounds. If a significant amount of algal and worm biomass was killed by the collection and curing process, this material will mostly remain in the rock, where it will rot. Instead of functioning as a biological filter, such rock would contribute to the system's organic load as these rotting materials slowly diffuse out of the rock over a period of several months. Growth of coralline algae over the rock's surface will close off most of the small channels and passageways, largely contributing to the decline of the rock's biological filtration capacity. Hobbyists may further contribute to this degradation of filtering capacity by gluing coral fragments to the rock's surface, thus sealing off more of the pores. This may make the inside of the rock anoxic and, if there is much organic material inside the rock, it will start to rot. If the interior of the rock is subsequently exposed to the tank environment, such material could be deleterious. Some of the larger openings into the rock will remain. In some cases, these will become occupied by larger worms. The movement of these larger worms can help facilitate biological filtration in the rock, but they cannot maintain it anywhere nearly as efficiently as could the large populations of small worms that had been previously living in the rock. One of the characteristics one should look for in live rock that would contribute to its biological filtration capacity in a tank would be a good and diverse growth of animals on its surface. If these are present, it is likely that the necessary smaller animals that live in the rock are present. Rock that is naturally porous and relatively light weight for its size would likely have more highly perforated internal regions and would function better in this regard. Aquacultured rock with a good growth of animals on its surface should be as good as natural rock when it comes to biological filtration. A good growth of animals on the surface implies a good recruitment of smaller burrowing forms in the rock. It is possible that some of the so-called live rock available for the aquarium hobby can provide significant biological filtration; however, that rock has to be carefully chosen for its array of animal life present. Rock without animals in it will not be effective at being a filtration medium as there is no way for the interior porosity and presumptive bacterial beds to be functional without a way of moving water through the rock, and the only way that movement may be accomplished is by animal action. Over the next several months, Eric Borneman and I will be examining several types of live rock, and we will determine just how much life is found living within these rocks and how effectively they could act as biological filters. These results will be published in Reefkeeping Magazine. I would like ask that if any aquarists have 1) test kits for sulfide or 2) dissolved oxygen, and a syringe with a long narrow hypodermic needle, that they attempt to make measurements of these two variables from the centers of large pieces of live rock. The hypodermic needle would need to be placed deeply, and carefully, in the rock through a small opening or pore. The water would have to be carefully and very slowly withdrawn from the rock and then tested. Such data should be sent to me for incorporation into the master data. At the present time, the data about the internal environment of the rock are ambiguous; but they are also very sparse, and more data are needed. Capone, D. G., S. E. Dunham, S. G. Horrigan, and L. E. Duguay. 1992. Microbial nitrogen transformation in unconsolidated reef sediments. Marine Ecology Progress Series. 80: 75-88. Risk, M. J. and Muller, H. R. 1983. Porewater in Coral Heads: Evidence for Nutrient Regeneration. Limnology and Oceanography, 28: 1004-1008. Kohn, A. J. and M. C. Lloyd. 1973a. Polychaetes of Truncated Reef Limestone Substrates on Eastern Indian Ocean Coral Reefs: Diversity, Abundance, and Taxonomy. Int. Revue ges. Hydrobiologie. 58: 369-399. Kohn, A. J. and M. C. Lloyd. 1973b. Marine Polychaete Annelids of Easter Island. Int. Revue ges. Hydrobiologie. 58: 691-712. Odum H. T. and E. P. Odum. 1955. Trophic Structure and Productivity of a Windward Coral Reef Community on Eniwetok Atoll. Ecological Monographs. 25: 291-320.